Marketing specialist Mike Rudd shares his advice on how to market a rec sports league. It's easier than you think. I had the chance to chat with Mike Rudd about how to market a rec sports league, create brand identity, and how to live life to the fullest. Mike is an author, radio marketing specialist, basketball enthusiast, and self-proclaimed hot dog stand extraordinaire (we'll touch on that soon). I spread good vibes, I ask you to demand the best of yourself, and to seize the day. Really what I am all about is helping people tap into their passions. Especially in sports marketing, in sales, and in personal branding. I firmly believe that everyone in their lives has a hot dog stand, which is a metaphor for a passion or calling. Mike's passion for helping others has led him to curate a blog, produce a podcast, and publish two books. Mike started his philosophy in college. 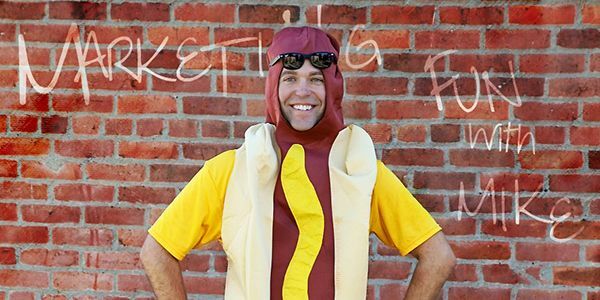 He paid his way through Ohio State Business school by working at – you guessed it – a hot dog stand. And while this job wouldn't appeal to most people, Mike loved it. As he neared graduation and started to plan his future he found many, if not all, of the job paths on his radar, were boring and bland. They didn't give him the same satisfaction as the hot dog stand did. I always just assumed I'd find a job I didn't really like, didn't really hate and ya know kinda go through the motions and then it dawned on me you didn't need to go through the motions in life. Moving forward Mike began a long and successful career in sports talk radio, combining his passions for radio and sports. He continued to grow into consulting and writing over time. The foundation of Mike's work is built on his passion and he encourages his readers to build their business or idea in the same way. In 2013 Mike created and ran a free youth basketball day camp, fulfilling another one of his passions by sharing his love of basketball with kids. I was a coach for basketball for about ten years. It was great. I worked with kids four months a year, for two years at a time. But I still wanted to do more. That's when Mike thought of a free camp for kids to get great basketball training. It was something that I am very passionate about. Once again pushing that envelope in life, which is what I encourage, tapping into those passions. We always want to do more and we can. Ready to practice what he preaches, he started gaining sponsorships and bringing shape to his idea. How did Mike plan this all by himself? While it was my idea, I had a village of people who helped. A village of wonderful co-workers, family, friends, and community members who helped out. The community center donated space all day. Former Ohio Buckeyes basketball star players Scoonie Penn, Matt Sylvester, and Jay Burson came out and donated their time. I was truly blown away and grateful for all the help. We hit capacity in 3 ½ days. All 110 spots filled. The kids, the important part and the reason why I did it, had a heck of a time and got basketball instruction from some phenomenal coaches and mentors. There're camps like that, that cost $500 a day. We got to offer our camp for free. We put our own spin on it make it fun, make it exciting and make it very valuable from them. Our goal this year is to turn it into a 2 day camp. Building ideas from the ground up is tough. It takes work but it's so fulfilling and it's the stuff the world needs more of. If you're trying to launch that idea first and foremost you want to be sure you create an incredible day for those participating. If you're planning on having another event the following year you want to keep in mind how you can grow and scale from that first year. The next thing I would recommend would be to find people who share your passion and they will help you and support you. All my buddies who played in college, coaches from around the area that I have contacts with, they are all passionate about basketball. How could they say no if I said to them "Guys I'm doing this free basketball camp no strings attached it's for the good of the community, can you help out?" There into that. They want to help. Know that there's going to be a lot of conflicts. No matter how much you plan something unexpected will always come up. Leave room in your plans for these changes. Okay so this one is obvious, but Mike had the right intentions for starting this event. He coached basketball for years and had a personal interest in the event. At the end of the day when things get hard having a passion or personal investment in what you're doing will help you keep going. Are you providing a league or event that is needed? Even with passion and smart marketing, if there is not a need in your community you won't see a good turn out. In Mike's case, he received an awesome turn out because his camp was truly needed in his community and he knew it. Mike admits, starting, running, and growing an event is hard work. There are ups and downs. but at the end of the day the fact that he was able to grow his passion and help other through his work, he was fulfilled. He enjoyed the work because of this passion. That's something you just can't fake. All of the successful leagues/events we have seen have a passionate individual behind them. Take the first step. Make a list of 10 things you need to do to start it. Every day do one of those things and you'll be shocked by what you are able to complete in just two months. It may sound a little cheesy but it's true. Mike attributes much of the event's success not to his own actions but rather the village or team that helped him along the way. We can't do everything ourselves, even though sometimes we want to. Mike knew his strong suits, having the idea, the connections, and marketing experience. The rest he needed help for and he found it. Coaches, volunteers, space, and more. He built a strong team which in return built a strong event. So let's get to the good stuff, what we all want to hear from Mike, his advice on branding and marketing your idea, league, or company. With his marketing degree from Ohio State Business school and years of experience in the sports industry, Mike has developed a unique take on marketing. Everything has to have a soul and heartbeat. You're not marketing your product, you're showing people the life they can have if they use what you're representing. I think I had that backward when I started out. I eventually realized there's no purpose for the end user if there is no soul or heartbeat. For Mike that heartbeat is the hot dog stand, so to speak. Plenty of resources are available for learning how to develop a marketing campaign and tools to manage them, but all of that is completely useless if the underlying passion and fire are missing. Mike's advice? Before you begin to dive into the specifics of how you plan or promote your league, think about your purpose. What's your goal? Identifying the core value is the first step in a successful marketing plan. One look at Mike's blog and you'll notice it's not like other marketing blogs you've seen. This is largely due to his strong focus on brand identity and passionate living. His template for creating a brand identity starts with a simple question. What is the one story in your life that makes you a little bit different from everyone else? What stands out? It's likely a story you might not even be thinking about. Start there. Start building that story, then eventually creating a personal brand around that story. Once you find the story that is the core of your league, idea, or company, the rest of the planning process becomes easier. If you can do that you can create that strong identity it will allow you to offer unique value to whatever target your serving. Whatever career path you're in, whatever position you're in, whether it's products or it's smiles, start thinking about that story. Whether you're learning how to market a league or just looking for your passion in life head on over Mike's blog for more inspiration and advice. A big thank you to Mike for sharing his thoughts and advice with us. Ready to take the first step towards starting your league or event? Check out our Complete Guide to Organizing a Sports League and start today! Are you a sports manager? Save time and stress with our schedule maker, registration software, referral program, waiver solution, and website builder.